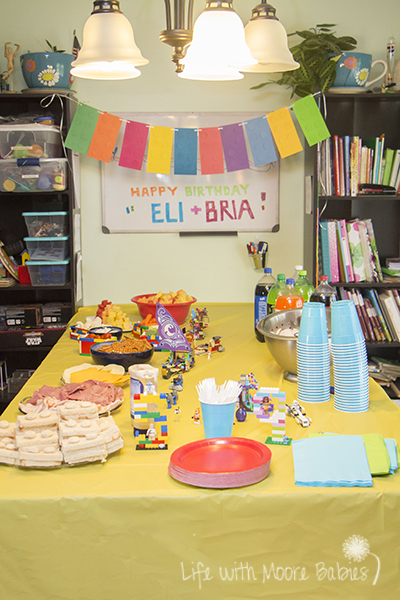 TWO kids with birthdays in the same month, mean we host TWO birthday parties TWO weeks apart EVERY YEAR! That's twice the stress, twice the cost, and twice the cake (maybe not all bad except when you have to prepare it). 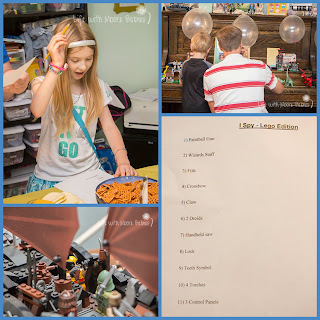 I have considered having their party together to reduce my stress load, but with one being a girl and one a boy and 4 years in between, I am usually left with whiny, "I don't like that theme," or "that's for girls." And after 4 years of this, birthday parties were about to be called off for good! This year would be different, it had to be different! Thanks to Lego it was! Oh yes, I got my daughter and son to AGREE on a birthday theme! 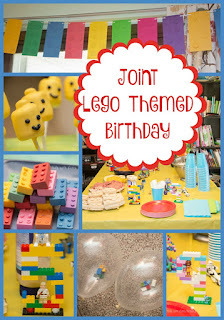 And throwing a joint Lego Birthday Party really could not have been easier! 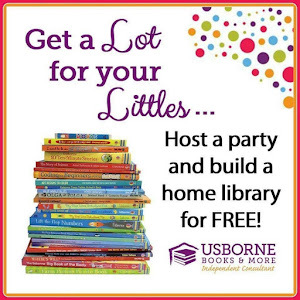 This was one of the easiest and cheapest parties I have thrown! One of the points we used to compromise on was their invitation. My daughter is into Lego Elves; so much so, that after spending her birthday money, she is just missing one set! My son chose Lego Star Wars because he likes robots (5-year-old logic there). With a combination like that pre-made invites were pretty well out of the question. 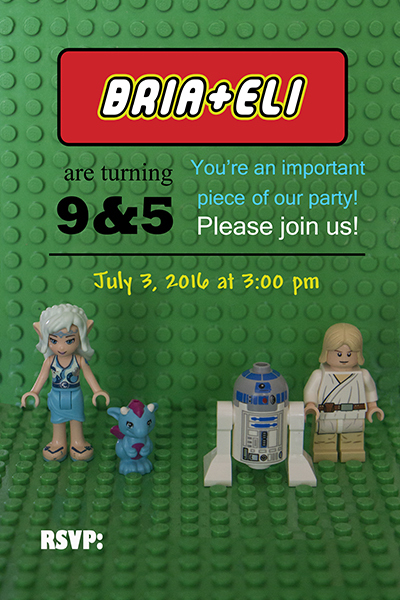 So we created our own invite with their favorite Lego characters following the basic instructions HERE. One great thing about being married to a nerd is the quantity of Legos we already had in the house. Decorations were seriously no a problem for this party. My husband brought all the Lego sets he already had together upstairs, and that alone covered most of the empty surfaces in the house. 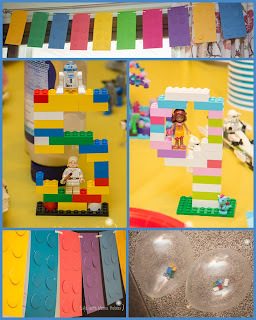 I did make some cute Lego banners by gluing card stock circles to rectangles and threading a ribbon through them. This was the most time-consuming part, but with help from my husband we had it done in an hour or so. The kids put together Lego numbers to represent their ages. 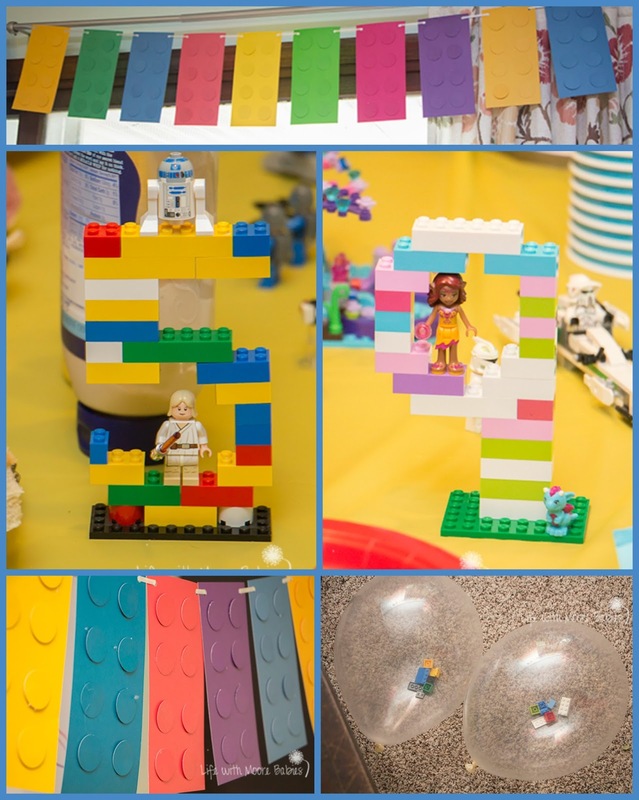 Every party needs some balloons; we chose clear ones that we could add Legos to! The balloons looked festive, but they popped much easier than normal because of the Legos. Not only that, but we found when they popped the Legos flew! So I would only do this if the kids are NOT going to handle them! Did I mention how stressed and tired I have been lately, it's been an ongoing theme since having my fourth baby over a year ago. And because of this, I went really easy on the food prep too! With a mid-afternoon party, we really didn't need a full meal. I did make sure we hit all the normal party food groups though! Lego sandwiches - I just set the little circles on the bread for looks! Building block pretzels - Open bag, dump in bowl! Veggie boxes - Kids built the boxes; I washed and lined with foil just to be safe. Fruit towers - Cut the fruit into very poor examples of blocks and stack. And Desserts! 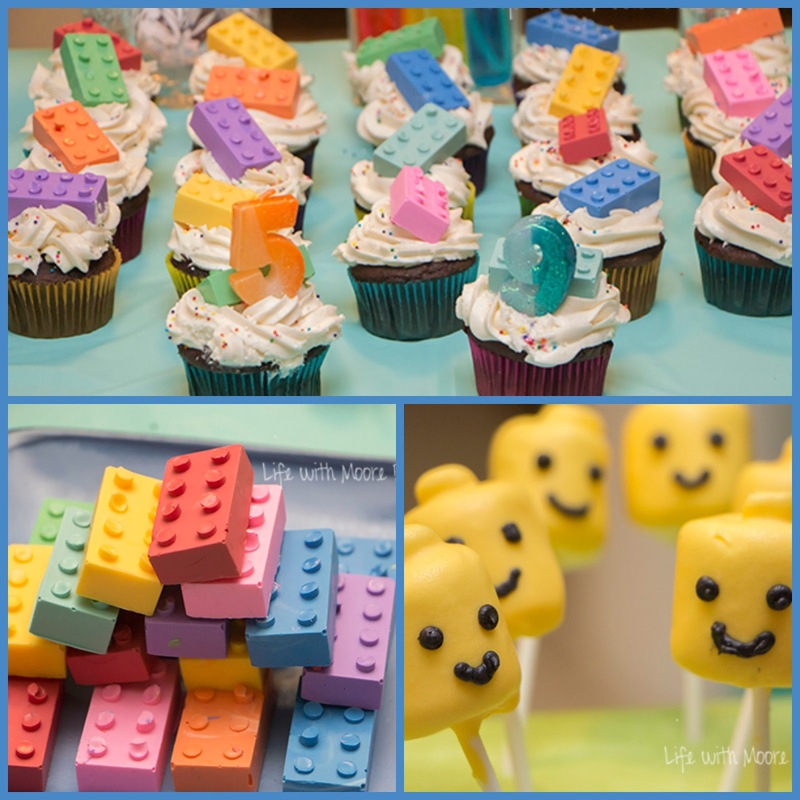 There is never a shortage of dessert at this house; we had cupcakes iced by the girls with chocolate Lego bricks on them. The Lego bricks were easy to make with candy melts and a silicone Lego shaped mold like the one below. 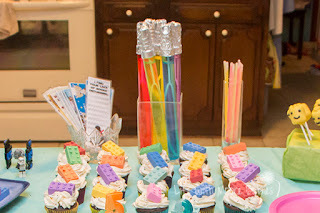 I used all the candy melts I bought to make bricks, so we had more than enough for our cupcakes. I stacked the extra on a plate. Another fun Lego dessert were our Marshmallow Lego Man Heads. 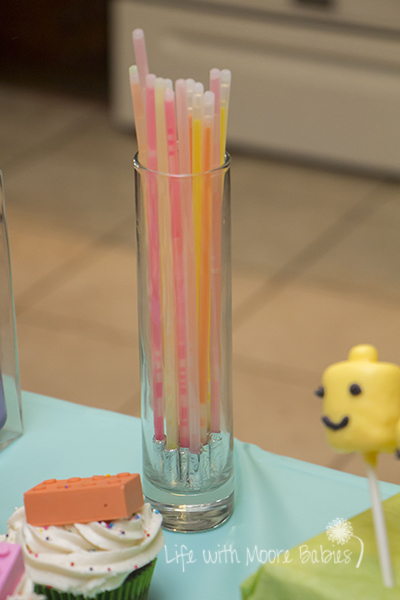 These were made from large marshmallows with a half small marshmallow for the peg dipped in yellow candy melts. 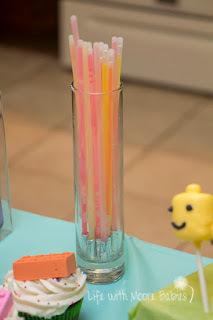 Attach the small marshmallow with candy melt, and be sure to dip the stick in melted candy melt before sticking in the marshmallow to keep them together when you dip the entire thing! Use a little extra icing to make the faces! 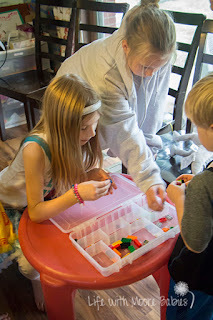 I had totally not prepared games because the kids usually just want to run around together plus stress until the day before the party my oldest says, "can we have party games?" Luckily my quick thinking husband saved my head from exploding by typing up an I Spy for all the Lego models that were sitting around. He even tried to fool people by rearranging the models; at least last I checked Wolverine was not visiting Middle Earth. We also had the kids make some Lego necklaces. All they required were blocks with the same size plates, small decorations, and ribbon. 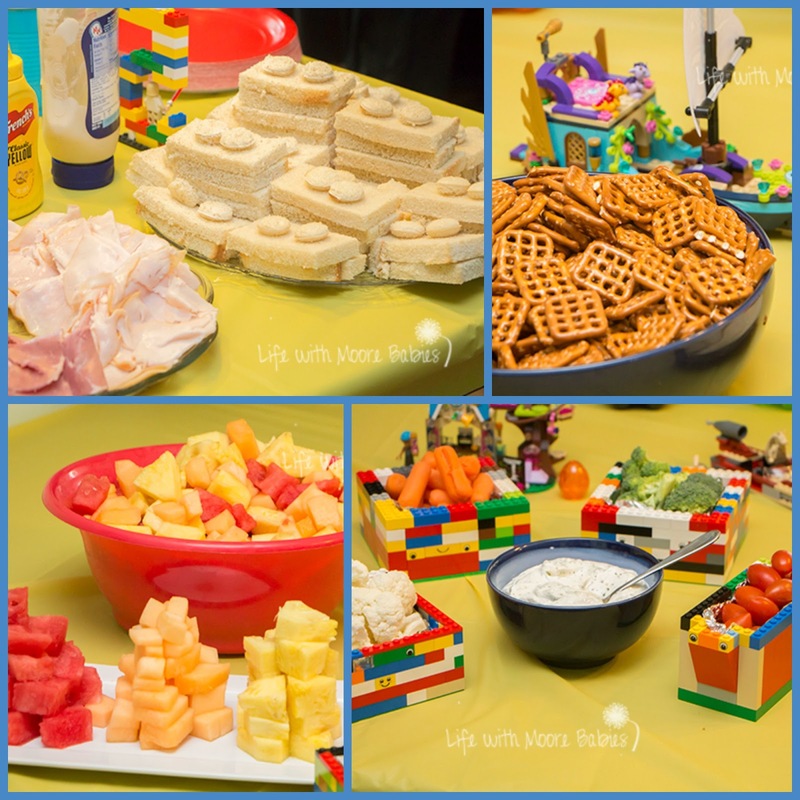 Just snap the Legos together for a mix and match creation! I totally missed getting pictures of the final products to show you all! Besides their necklaces, we also had light saber glow sticks, light saber bubbles, and bookmarks. My husband even wrapped the connectors of the glow sticks and the handles of the bubbles with foil to make them look more like light sabers. 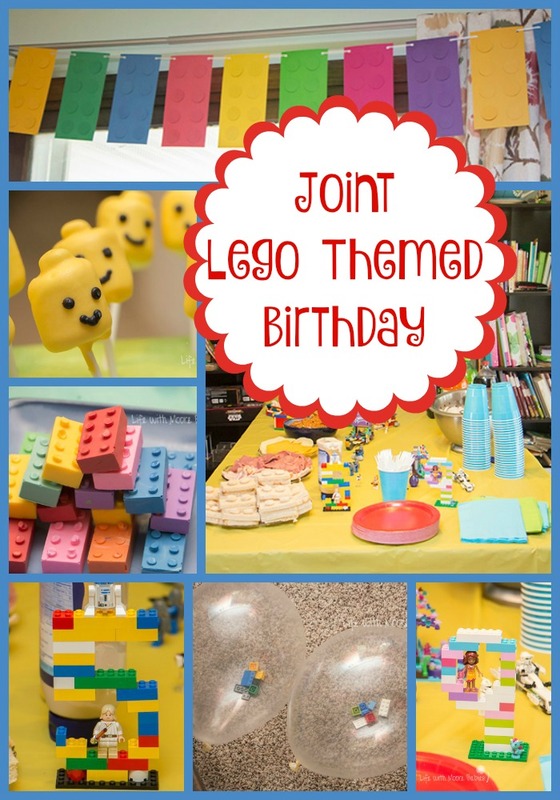 Gifts were opened, cake was consumed, and for once, the pressure in my head remained at a normal level, so I would say our Joint Boy/ Girl Lego Party was a success! As a plus, it was done cheaper than any other party we have thrown, and I don't have to repeat it in two weeks!